Have you tried Juice Beauty yet? Whether you're on a new natural beauty and health mission or just want to try something new, Juice Beauty is a high quality, organic, anti-oxidant packed line with clinically proven results that delivers. Since your skin absorbs over 80 percent of what you put on it, what you put on your skin is just as important as what you put in it. Juice Beauty’s revolutionary formulations started with a basic premise by starting with an antioxidant and vitamin-rich organic juice base rather than water, (which dilutes) or petroleum derivatives, (which suffocate the skin and are often laced with harmful chemicals) and combining it with powerful, organic age defying and blemish clearing ingredients, it's clinically proven to achieve better results than conventional products. Celeb fans include A-list celebs like: Candice Bergen, Cameron Diaz, Ashley Judd, Shirley MacLaine, Toni Collette, Madonna, Cindy Crawford, Jenny Garth, and Ray Romano. In addition, Juice Beauty is the set beauty product provider for” CSI Miami”, “The Sopranos”, “ BostonLegal”, and the Tim Robbins film, “Zathura”. Some of their award winning products are Juice Beauty’s Stem Cellular Collection which is formulated with a proprietary blend of fruit stem cells and Vitamin C infused into an organic, resveratrol-rich juice base. Other innovations include Juice Beauty’s patented, bestselling, award-winning and Kate Hudson's fav, Green Apple Peel. With patented blend of organic malic, tartaric and citric acids and, of course, the proprietary, antioxidant-packed, organic juice base found in every Juice Beauty product. Today, Juice Beauty offers antioxidant-rich and clinically proven skincare, makeup and hair care products that meet the most stringent organic regulations in North America. 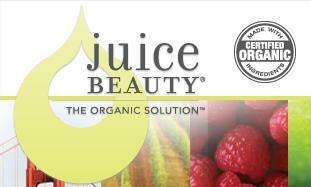 Please visit www.juicebeauty.com for more information.